Two years ago I bought a pint of beautiful kumquats at the Green Market. I remember having them around the house at least once when I was young, but I don't remember what anybody did with them. I do remember tasting them once. They were sour, and not at all like the oranges they resembled. I did not feel the need to try them again until I saw them at the market. I had a vague idea of cooking them with chicken, so I put them in the refrigerator and made a mental note to get some chicken during the week. And promptly forgot all about it, until a few of weeks had passed and I ran into them at the back of the produce drawer. Kumquats, like most citrus, keep pretty well for a while, but these were definitely past their prime. I hate to admit it even now, but I had to throw them away. I did not see any more kumquats at the market that year, so I missed my chance. I saw them again a year later and yes, I did buy them. I stopped and got chicken on the way home so I would have no reason not to make it right away. I decided to throw the chicken and kumquats into the slow cooker with some sprigs of thyme, onions, white wine and water. I had previously come up with the brilliant idea of painting the rusted inside lid of my water bottle with nail polish to seal the rust and keep it from falling into the water, which it was starting to do. The dish cooked up beautifully, and smelled heavenly when I lifted the lid off of the slow cooker. I eagerly served up a plate over some brown rice and took a bite. And it did taste good, except that there was a nasty aftertaste that I couldn't quite identify. Until I realized that it tasted the way nail polish smells - a sharp varnish-y smell that goes straight to your brain. Apparently, the fumes from the nail polish permeated the water. It probably would have been ok to eat it, but I couldn't get past that nasty aftertaste. So much for my second attempt. There was a third attempt. This time I ran into the kumquats at Treasure Island quite unexpectedly. I chopped up all the vegetables and the kumquats and threw them into the slow cooker while I defrosted the chicken that had been in the freezer for a few months. After it was defrosted, I realized it might have been in the freezer longer than I thought (so much for Operation Freezerburn.) Bottom line, I did have a bag full of frozen chicken bones and backs in the freezer as well, and it made some excellent chicken stock. But still, no chicken with kumquats. Until last weekend. Treasure Island had kumquats again and by now I was determined that I would successfully make this dish. I remembered to buy a chicken at the Apple Market the next day and went to work that night. With great success. I went with the oven instead of the slow cooker since it's so cold outside. And came up with a winner. Chicken and kumquats are a natural pair. Honey takes away the sourness, and the citrus brightens everything up beautifully. Cut kumquats in half. Don't worry too much about the seeds, but set aside about 10 halves that look juicy and don't have seeds. Thinly slice those halves. it is well coated in the oil and honey. Season with salt and pepper. Lay 6 sprigs of thyme on top. Arrange chicken pieces over the bed of onions and kumquats. Insert the reserved sliced kumquats under the skin of each piece. Pour another tablespoon or so of oil over the chicken, then season well with salt and pepper. Strip the leaves off of the four thyme sprigs and sprinkle them, along with the marjoram, over the chicken. Cover with foil and bake for one hour covered, then another half hour uncovered, until chicken is done. vegetables are just tender, about 40 minutes. If the chicken is done before the vegetables, remove from the oven and cover loosely with foil to keep it warm. Remove the thyme sprigs and discard them. Strain the liquid from the kumquat and onion mixture and use it to make couscous (add water if there is not enough liquid). Discard onions and kumquats. 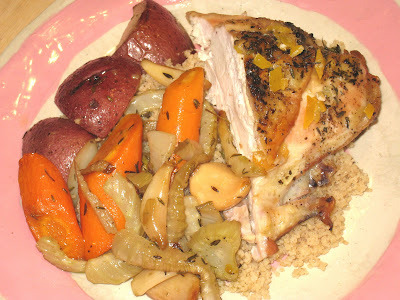 Serve chicken and vegetables over the couscous.